Tram routes 7A and 7B will be diverted from Monday 8 August to Sunday 14 August. Tram 7A will leave from the "Ratapihantie" (0620) stop of tram 7B by Pasila station and run along Asemapäällikönkatu and Ratamestarinkatu to Radanrakentajantie, from where it will continue as usual to the junction of Mannerheimintie and Nordenskiöldinkatu and further to the Kuusitie loop, from where it will return to Pasila under route number 7B. The trams will not serve the section of route from Nordenskiöldinkatu via Länsi-Pasila to Pasila station. On this section of the route, the trams will be replaced by bus 7X. The replacement bus will leave from Pasila station in the direcion of Töölö from the "Ratapihankatu" stop 2182 and run along Veturitie, Nordenskiöldinkatu and Mannerheimintie to Topeliuksenkatu, from where it will turn to Pasila station via Nordenskiöldinkatu and Länsi-Pasila. 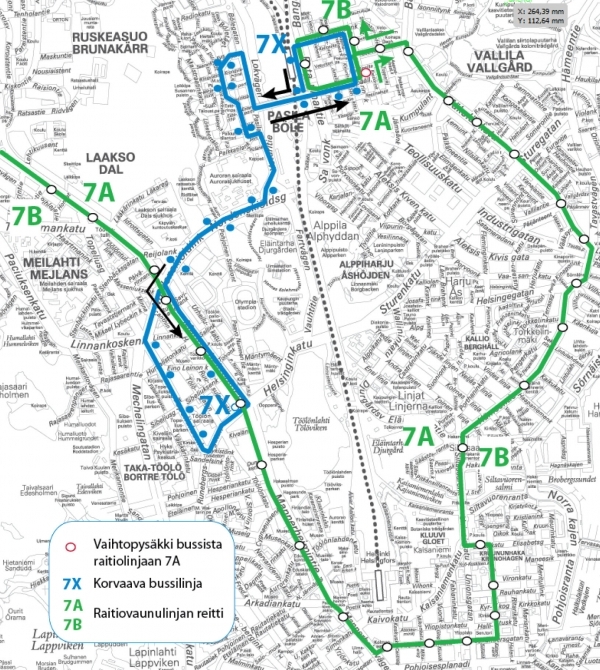 In Länsi-Pasila, the bus 7X will serve tram stops, otherwise it will serve bus stops along its route. In Pasila, passengers can change from bus 7X to tram 7A at the ”Ratamestarinkatu” (2166) stop located on Asemapäällikönkatu. In Töölö, the best place to change from tram 7A to bus 7X is the "Ooppera" (1332) stop on Runeberginkatu. Tram 7A will not serve the following stops in Itä-Pasila: "Pasilan asema" (0611, Pasila station), "Messukeskus" (0613) and "Kellosilta" (0615). The diversion is due to track work and excavation work on the Pasilansilta and Pasilankatu.